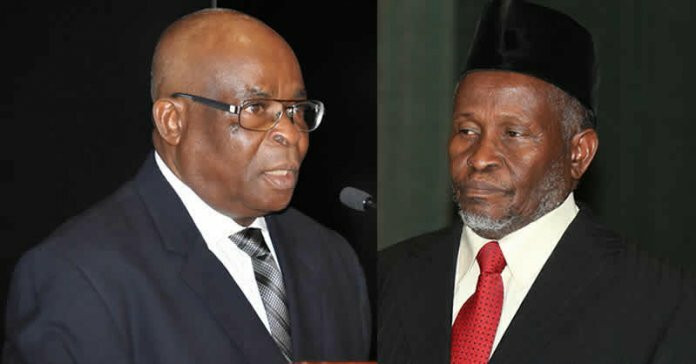 The embattled Chief Justice of Nigeria (CJN) Walter Onnoghen and the acting CJN Tanko Mohammed have responded to the queries issued to them by the National Judicial Council (NJC). Dailytrust reports that the NJC had at its meeting on Tuesday, January 29 directed Justice Onnoghen to respond to a petition by Zikhrillahi Ibrahim of Resource Centre for Human Rights & Civil Education, while Justice Mohammed was directed to respond to two petitions by the Centre for Justice and Peace Initiative, and Olisa Agbakoba (SAN). According to the report, the petition against CJN Onnoghen is believed to border on alleged non-declaration of assets, which was the case brought against him by the Code of Conduct Bureau (CCB) at the Code of Conduct Tribunal (CCT) in Abuja after an earlier petition by Dennis Aghanya of the Anti-Corruption and Research-Based Data Initiative (ARDI). Meanwhile, the acting CJN Mohammed is facing allegations by Agbakoba of presenting himself to be sworn-in as acting CJN without the recommendation of the NJC. The replies, which were said to have been made since on Tuesday February 5, has not been made public, but Justice Onnoghen had in his statement to the CCB explained that he forgot to declare some of the domiciliary accounts linked to him. Meanwhile, the NJC will reconvene to consider the responses of the two justices on Monday February 11. A staff, who has knowledge of the NJC, said before the meeting, a panel of about five members may have already been constituted to review the replies for presentation to the meeting of the whole house. “If the NJC is not satisfied with their responses, they may set up another panel. It would not be more than two days. But I envisage a situation where the NJC would act swiftly because of the situation,” the source told Dailytrust.